A Flying Jatt has done what it was set out for. Released a day earlier on the partial holiday of Janamashtmi, the idea was to get the right buzz floating before the weekend ensued. With good footfalls coming in already even as Saturday and Sunday are yet to follow, this Remo D’Souza entertainer is already on its way to fly high. “The kind of hype that the film had started to generate, especially during the last few days, pretty much warranted that it arrived a day before Friday itself. Moreover, its release on a festival like Janamashtmi was apt as well. Other than the religious significance that it carries, it was also the good time to target kids. Most of the schools were off on Thursday which means the day was just apt for this Remo D’Souza directed film to begin making an early impression,” says an industry insider. The ploy worked as kids have gone back ‘maha impressed’ after watching the action unfold on screen. “The fact is that the current generation of kids who are around 10 years old take matters like pollution very seriously. With the significance of being eco-friendly being evangelized quite well in schools, these kids are much more aware than ever before about such matters. No wonder, when something like is told in an entertaining manner, the connect is established even better,” a Principal of a leading Mumbai based school adds. 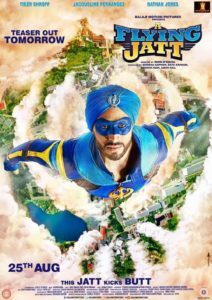 Considering the fact that A Flying Jatt is not as much about saving the world from alien forces as it is about saving it from the ‘aam junta’ (by means of taking care of everyday pollution), the Balaji film has managed to hit the hardest where it hurts most. With the opening day numbers already quite positive and the real treat yet to come in the weekend to follow, guess it is about time for A Flying Jatt to indeed fly high.